Why buy land for sale at Manor Farm Cottages? A fantastic opportunity for you to own a parcel of land strategically located within a much sought-after and affluent area. 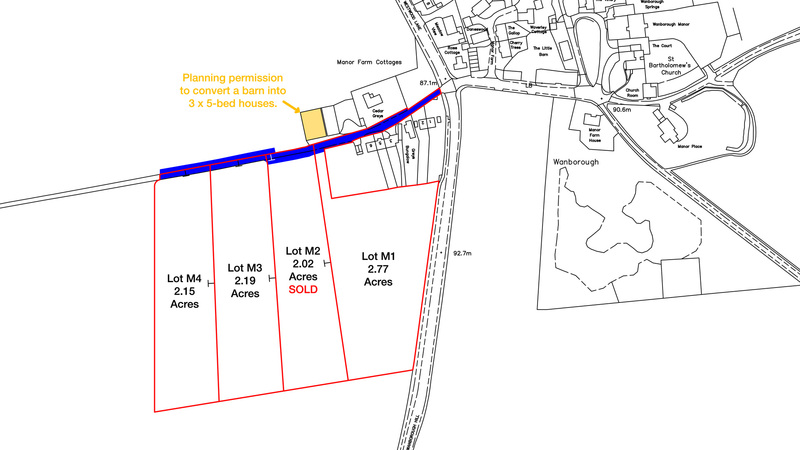 Totalling just over 9 acres the land is for sale as a whole on in just 4 lots. The site is flat and benefits from excellent private track access to all lots from Manor Farm Cottages. Lot M1 also enjoys extensive road frontage onto Wanborough Hill. The land lies just off the A31, which joins the A3 that links the site to London and the M25. The land is situated between the extremely affluent villages of Puttenham & Wanborough within the Borough of Guildford whose proposed Local Plan plans to build thousands of new homes across Green Belt land. The land opposite has already received planning permission to convert an agricultural barn into a 3 x 5-bed houses. The land is for sale freehold and is suitable for a variety of amenity or recreational uses. Due to the sites location, local development and the need for housing in the area, the site could have long-term investment and development potential (STPP). All lots benefit from excellent private track access from Manor Farm Cottages off Wanborough Hill where Lot M1 also enjoys road frontage. Full vehicular right of way is provided via an easement (shown blue on the site plan). The land is offered for sale by private treaty as a whole or in lots. The freehold is available with vacant possession on completion. 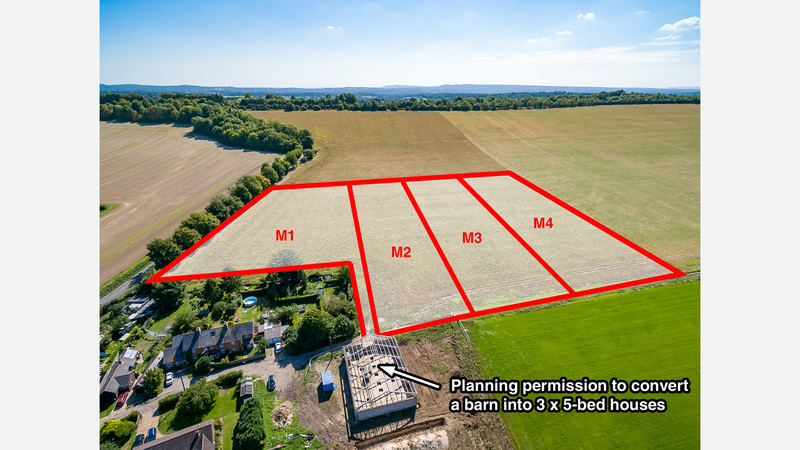 A parcel of land to the north of the site and within the original farm has received planning permission to convert an agricultural barn into three 3 x 5-bed houses totalling 611 sq.m. (Ref: 18/P/00765). The land is subject to an Overage based on 20% of any uplift in value following the grant of planning permission for development other than for agricultural, equestrian or forestry purposes. The Overage period is 80 years. As with all the southern half of the Borough of Guildford, the land is designated as an Area of Great Landscape Value. The land also falls within the Green Belt and the Surrey Hills Area of Outstanding Natural Beauty (AONB). Any development would be subject to the appropriate planning permission. Not looking for land for sale at Manor Farm Cottages? The land is west of that which has received planning permission to demolish an agricultural barn and replace with a 450 sq.m. new house. There is a significant demand for new housing in the region. The highest need is in the Borough of Guildford, which has a requirement of 654 new homes per year until 2033. The Borough of Guildford’s Local Plan identifies how land is used, determining what and will be built and where. The proposed Local Plan published in June 2017 plans to build thousands of homes across several Green Belt sites. 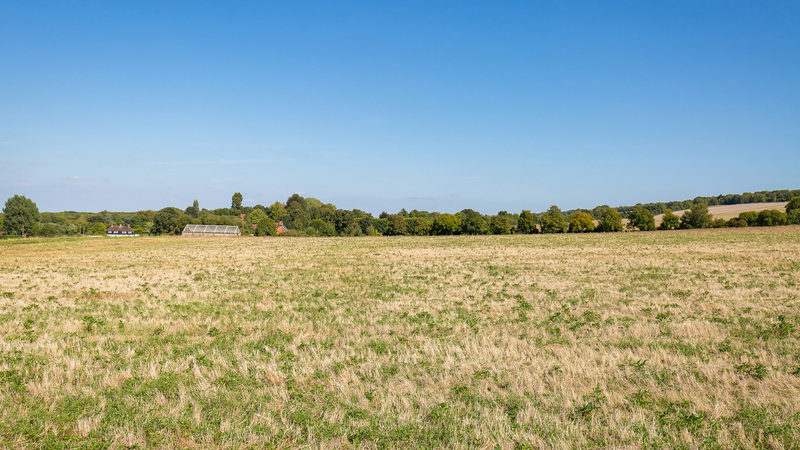 These sites include; 1,800 new homes at Blackwell Farm part of the University of Surrey, at least 1,700 new homes at Gosden Hill Farm, 2,000 at the former Wisley Airfield and 400 at Garlick’s Arch. 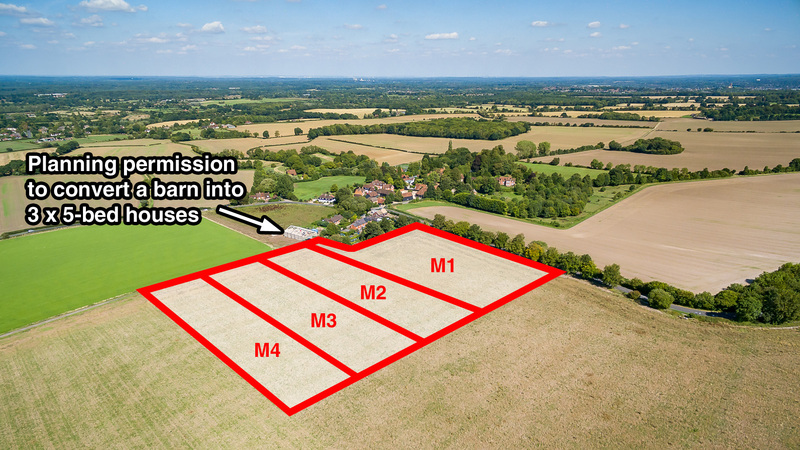 The proposed Blackwell Farm development within the Green Belt is just 2 miles from the land for sale. Plans include; 1,800 new homes; local amenities; an extension of the Surrey Research Park; retail units and business park; a primary school and a secondary school. Development on the fields of Blackwell Farm would leave “little hope for the rest of the green belt”, a campaign group has said. The land is situated in an extremely affluent area where land and property values are amongst the most expensive in the UK. House prices in Wanborough are 96% above the county average, 186% above the regional average and 279% above the national average (Zoopla). These premium house prices reflect the desirability of the area as a place to live and own property – including land. 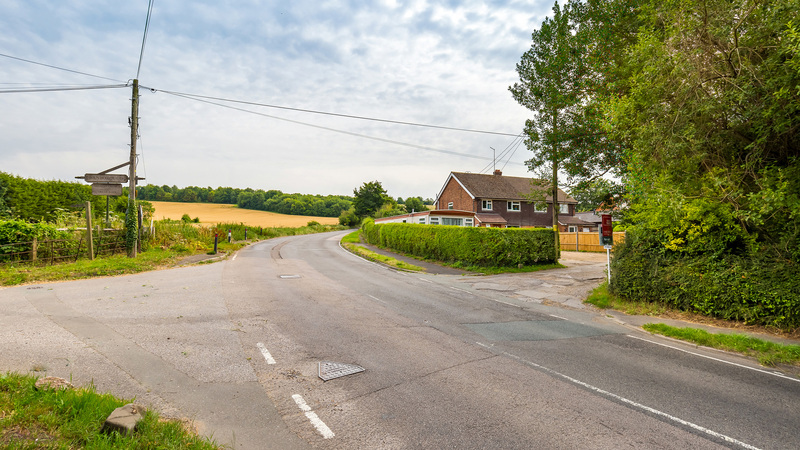 The land is situated within the extremely affluent village of Wanborough in the Borough of Guildford on the northern side of the Hog’s Back area of the beautiful North Downs. Guildford is a large town in Surrey, which has the highest GDP per capita of any county in the UK. Surrey is said to have the highest proportion of millionaires in the UK. Guildford is one of the most expensive places to buy property outside London and due to recent developments the town now forms part of the Greater London Built-up Area. The area has been voted one of the best places to live in and is considered the best luxury shopping destination outside London. There are a variety of independent shops, boutiques, cafes and restaurants along Guildford’s famous cobbled high street, and no less than three separate shopping centres with traditional high street names. Guildford is also a thriving commercial town with five of the top Global Companies boasting a significant presence within the town. The land lies just off the A31, which joins the A3 that links the site to London, the M25 motorway and the South Coast. Nearby Guildford station offers frequent & direct train links into London in just over half an hour. The Great Barn of Wanborough is across the road from the site and is considered the oldest and most important medieval barns in the South East of England. It was built in 1388 by the Cistercian monks of Waverley Abbey. From here there is a bridlepath that leads to a network of other bridleways via a footpath. There are several livery yards close by including Parwood Equestrian Centre just over a mile to the north in Normandy. Parwood is one of the finest Equestrian Training Centres and Livery Yards in the UK. Set in 180 acres of stunning Surrey countryside, Parwood combines first-class BHS approved livery and training facilities with some of the most diverse and picturesque riding opportunities in the country. Its impressive facilities include a floodlit outdoor arena, show jumping field, cushion track indoor arena and a superb cross country course. To the south of the site is the historic Puttenham Golf Club, regarded by many to be one of the finest and friendliest golf clubs in the county. Its 18 hole, tree lined course is both challenging and picturesque. For the horse racing enthusiast, Ascot Racecourse lies to the north, home to the world famous and prestigious Royal Ascot meeting. 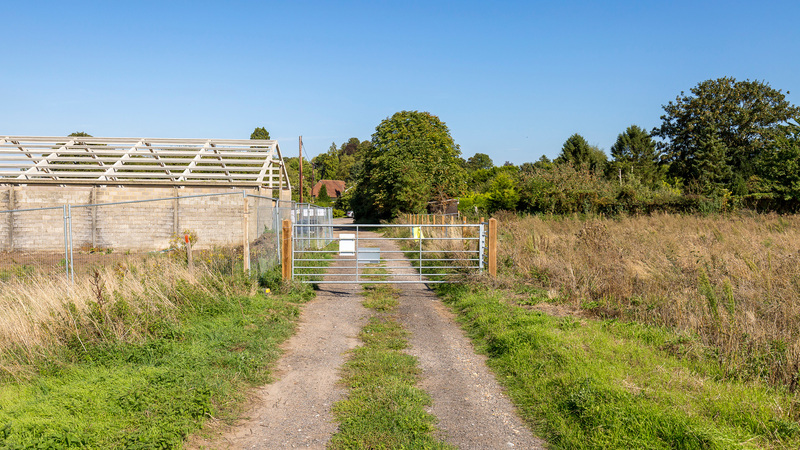 To arrange a site visit or to buy the land for sale at Manor Farm Cottages; please call 01727 701330 or email enquiries@vantageland.co.uk.